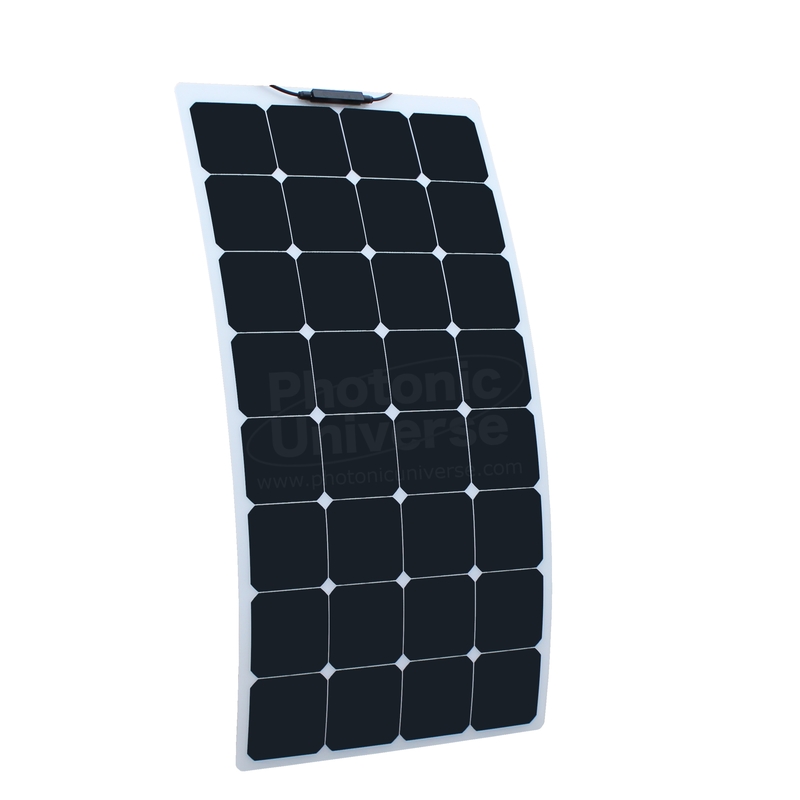 This high efficiency flexible waterproof 100W monocrystalline solar panel is perfect for permanent outdoor use to provide free electricity for charging 12V batteries to power various applications, such as in a motorhome, caravan, camper, boat, or for solar lighting systems, off-grid and back up solar power systems, and complete household solar power systems. Back-contact solar cells with efficiency up to 22% make this panel ideal for applications where space is restricted, or where there are obstructions on the roof. The panel can also be used to provide direct power supply for applications not sensitive to changes in input voltage / current (e.g. electric motors or pumps) and for various grid-tie applications. This 100W flexible solar panel is made of strong ETFE material which has a longer service life compared to standard semi-flexible solar panels. As a result, these particular flexible solar panels are extremely robust and less prone to cracking , delamination and corrosion. The lightly textured coating of this panel creates an anti-reflective surface which allows the panel to absorb a far greater amount of light, thereby increasing efficiency. ETFE material has long been used in applications where durability and high-temperature resistance is required, such as in the Eden Project, Cornwall.. The panel is fitted with 2 x 0.9m of cable specially designed for solar panels to carry high currents with negligible power loss (2.5mm cross section). The cable comes with waterproof MC4 connectors which can be used for easy connectivity to your existing system, for linking several panels together or for connecting a 2.5mm extension cable. The long-lasting, highest efficiency back-contact monocrystalline solar cells will give you years and years of consistent, free power. Sealed waterproof design ensures the panel can be used in all weather conditions. This flexible solar panel is normally fitted to a roof using a suitable sealant / adhesive (not included). It can also be screwed or bolted to the roof - holes of which can be drilled in the corners of the solar panel and sides where there are gaps between the solar cells.